The orange and blue blocks to the left, along Clark, are (we're guessing) within a quarter-mile of the Metra line that runs along Ravenswood. The rest are within a quarter-mile of the Red Line. If the expansion of transit oriented development happens, per the Mayor's proposal, the Metropolitan Planning Council has published a report about how it foresees the change affecting the 77 official community areas in the city of Chicago. 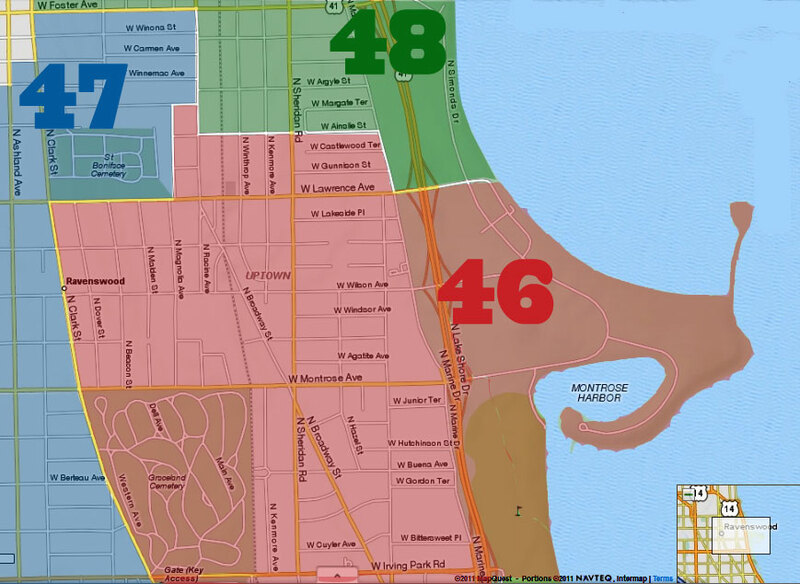 We've highlighted the Uptown projections. You can see the entire MPC analysis here. Got strong feelings about it? Contact your alderman. Oh Hell no. 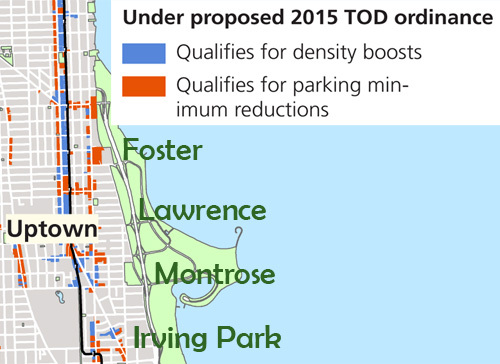 Uptown resident parkers are already paying more for garage parking than in many garages in the loop. We are inundated with persons flowing over from the parks and already have some of the highest population densities in the city. Why make it worse when new construction could be used to correct the problems that were created in the past?????? What the hell is happening today? I see the trolls are out. Something in the air no doubt. Or perhaps the impending demise of Disqus comments on DNAINFO has drive out of their lairs. Well at least we still have Uptown Everyblock to act like a magnet for the crazies and their multiple ID's. If you live in Uptown and have to own a car either pay for parking or move. It's not the alderman's job to provide you with inexpensive parking to the detriment of the larger community and the city as a whole. To paraphrase the first "Mare" Daley: Thppppppt! Seriously, get thy booty in gear and move if you absolutely have to have a car and refuse/unable to pay for parking. Simple solution. No neighborhood can fulfill every need. I own a SFH. I have a garage. I don't own a car because the economics don't make sense to me for the 5 times a year I might need one. I rent out my garage and rent a car when I absolutely have to which is once or twice a year. The only downside is the additional schedules my accountant charges me for on my yearly tax forms. Freaking renting out my garage pays half my property taxes a year. It's a wonderful thing. Other downside is rent collection, but I make the parkers pay six months in advance so it's not a monthly hassle. They gladly do it to keep their precious cars inside. "My precious". Now I used to own a car, but I found that I could live just as well without one utilizing the CTA, my feet, my bikes and a rickshaw I have pulled by my nephews Frick and Frack. I agree with IrishPirate. If those first two posters want to drive everywhere, they should move to Norridge. 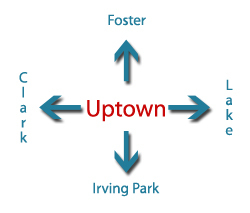 Uptown is a transit centric neighborhood whether they like it or not. Less cars, less pollution and more cleaner air for everyone. Uptown has no room for cars, find a job closer to home or move closer to work. Maybe you should think about the fact that some people may have a car and not drive every day, but should have to fight for parking, because the Alderman cares more about the people who use PT. If he would focus on the important things, like improving the crappy schools in the area. Maybe improve getting business that want to come to town.